I really enjoy a good barbecue. Thanks to the recent weather there’s been a lot of people mentioning their love for barbecuing over the past few weeks and many are sharing their barbecue stories with me. I particularly enjoy the excitement that comes with a barbie and the garden smelling of charcoal. The flavour that a charcoal barbecue brings to the produce is hard to beat. I often hear people mentioning that stepping up to the grill can be quite intimidating. Unlike in the States, where barbecuing is near enough a national sport, some of us here only cook over wood or coals a few times a year. I guess there’s nowhere to hide if it goes wrong, so I understand that it can be daunting. However, I truly believe that some easy tips should keep you on the right track. Firstly, be patient. When you spark up your barbecue and it gets really hot, resist the temptation to throw your food straight on in excitement. Let the coals burn down to nicely glowing embers and avoid cooking in direct flame. Your meat will char too much on the outside while remaining raw inside. Secondly, think about taste – marinating meats or rubbing with a spice mixed well in advance will allow the flavours to get into your cut of meat, giving it a fantastic rich depth. You can add flavour during barbecuing too. I love to get a big bunch of hard herbs like rosemary, bay leaf and sage, and create a makeshift brush by simply tying some string around the ends of the stalks. Keep this in a pot at the side of your barbecue, with some crushed garlic cloves steeped in oil, and continually brush your meat as it grills. It helps to lock the moisture in too, giving the meat a really tender end result. Lastly, don’t be shy – be experimental. As much as I really enjoy the steaks or burgers on the barbecue, I often put a whole cooked fish on the grill. As a family we love a barbecued slow-cooked roasted shoulder of lamb with all the trimmings on a Sunday if the weather is kind. I love getting myself organised with all the preparations. It’s such a fun meal to have with the kids and I get a lot of enjoyment seeing them tuck in to their meal. In barbecuing I truly believe the key is to manage the heat of your coals. Take your time, plan the process and try and enjoy it. I promise it will be worth it – especially with it being National Barbecue Week this week! 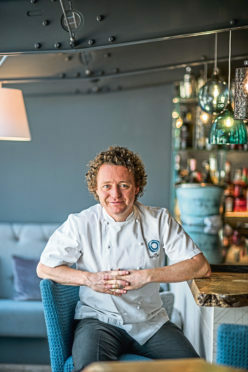 Tom Kitchin’s Meat & Game (Absolute Press, £26) is on sale now. Remove the pheasant from the fridge 20 minutes before cooking to bring it up to room temperature. Open the can of beer and pour out one-quarter of the beer – or drink it! Place the can inside the pheasant’s cavity, then place the pheasant on a baking tray to catch all the juices. About three-quarters of the can should fit inside the bird. Place the baking tray on the grill and leave the pheasant to cook for 25–30 minutes, depending on the size of your bird – I like to baste the pheasant every five minutes with the juices that gather in the pan. 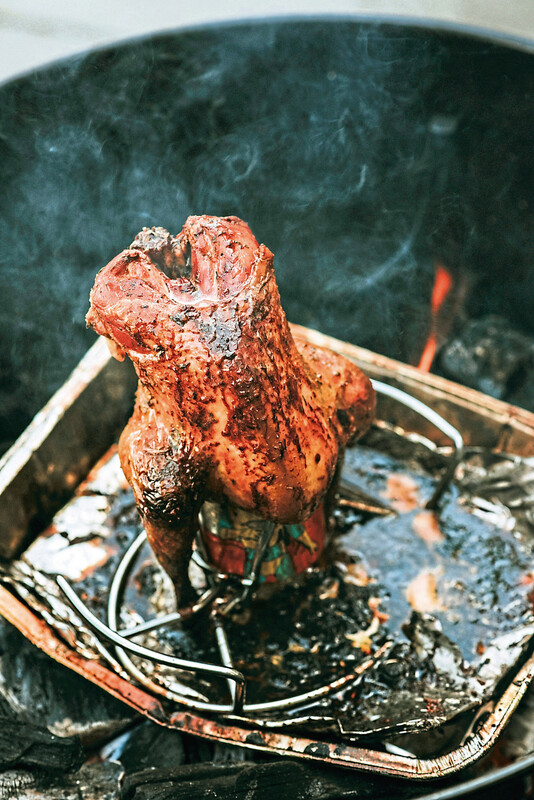 The pheasant is cooked when you stick a skewer into the thigh and the juices run clear. Set the pheasant aside to rest for five minutes covered with kitchen foil. Taste the juices, adjust the seasoning with salt and pepper, if necessary, then spoon them over the carved bird. This is a simple, rustic dish, so there isn’t any reason to strain them first. At least 30 minutes and up to three hours before you plan to cook, put the steaks on a platter and rub them with a good splash of olive oil and one crushed garlic clove. Cover with clingfilm and set aside at room temperature. Put the remaining garlic clove in a small bowl with olive oil and tie the thyme and rosemary sprigs together to make a herb brush for basting the steaks with while cooking. Meanwhile, to make the bone marrow marmalade, bring the water to the boil. Season with salt and add the garlic cloves, bay leaf, thyme and a splash of sherry vinegar. Use a small spoon or your thumb to push the marrow out of the bones. Reduce the heat to a simmer, add the marrow and poach it for five to six minutes until the pieces become very soft. Use a slotted spoon to transfer the marrow to a plate lined with kitchen paper and leave to dry, then roughly chop. Transfer the marrow to a small saucepan over a low heat. Add the beef jus, spring onions and shallot, and mix together. Add the parsley and a splash of sherry vinegar and season with salt and pepper, then set aside and keep warm. When you’re ready to cook, heat a large well-seasoned cast-iron, ridged griddle over a high heat. 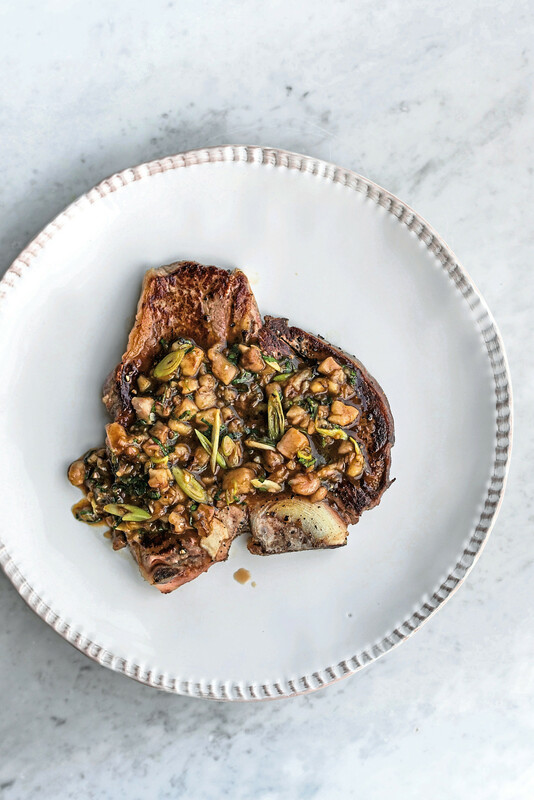 Season the steaks with salt and pepper and brush the rack with the garlic-flavoured oil. Place the steaks on the grill and cook for three minutes, then turn over and cook on the other side for two to three minutes for pink meat, basting with the garlic oil and herb brush. If you like your meat more well done, cook on the second side a bit longer. Set aside to rest for five minutes covered with kitchen foil. To serve, divide the bone marrow marmalade among the steaks and spoon over any accumulated juices. Place the lamb on a chopping board and use a small knife to make a few slits all over. Use a large pestle and mortar to grind the fennel seeds, ground cumin and paprika with a good splash of olive oil and salt and pepper to crush the seeds. Add the thyme and rosemary leaves and mix together. Using your hands, massage the spice and herb rub on to the shoulder and especially into the little slits. Cover the lamb with clingfilm and set aside for at least 20 minutes, or up to three hours. Meanwhile, preheat the oven to 220°C fan/240°C/gas mark 9. Place the shoulder in a heavy-based roasting tray and roast for 30 minutes so it seals well and takes on some colour. Now cover the lamb with kitchen foil and turn the oven temperature down to 170°C fan/190°C/gas mark 5 and continue roasting for a further four hours, or until the meat is tender enough to flake from the bone. Remove the lamb from the oven and set aside to rest for about 15 minutes covered with kitchen foil. Discard the fatty cooking juices in the tray. While the lamb is resting, bring a large saucepan of salted water to the boil and place a bowl of iced water in the sink. Add the beans to the boiling water and boil for four minutes, or until tender. Drain them and immediately transfer them to the iced water to stop the cooking. Drain the beans again, then transfer to a large bowl. Add the hazelnuts, garlic, shallots, a good splash of hazelnut oil and salt, and toss together. 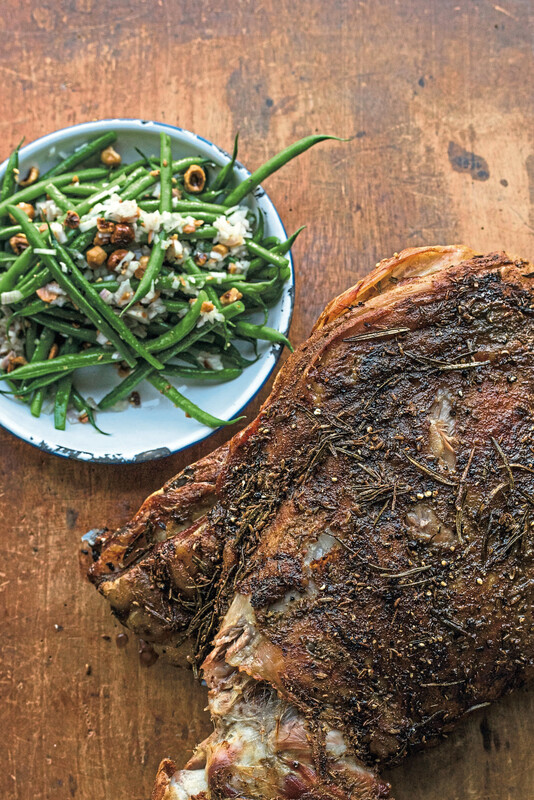 Serve the lamb with the French bean salad alongside.